Somewhere amid the film’s ornate imagery and deliriously irreverent humor, we might begin to realize that we’re watching a terrifying, incisive satire about the ways that a life lived online makes monsters of us all. Where the original film poked fun at games, this time, the subject of critique is the company’s own legacy. And it’s a smarter, more entertaining film for it. It’s a poignant buddy movie that’s sincere in all the right places, but knows better than to take itself too seriously. The imaginative, touching, and dizzyingly animated Ralph Breaks the Internet is a sequel with a rich, broad vision that addresses all of these issues faster than you can say Fix-It Felix. Ralph Breaks the Internet is everything that made Wreck-It Ralph enjoyable, painted on a canvas as big as the Internet itself. The satire is sharp and the pace is relentless, a can’t miss combination for a kid outing. Ambitious, beautifully animated, and clever to a fault, Ralph Breaks the Internet breaks free of the pitfalls of most sequels by never forgoing heart for the sake of bigger franchise pyrotechnics. Younger audiences will surely benefit from its messaging, but with such vivid characters it’s entertaining and emotional for all ages. For all of technology’s cold gleam, Ralph Breaks the Internet has real warmth, the kind born of compassionate, invested filmmakers. Who, yes, may be serving at the whims of a distressingly ever-expanding imperialist force, but have nonetheless done something rather nice under its watchful aegis. The real success to Ralph Breaks the Internet is how, while having the most amount of fun possible, it’s also able to be cleverly subversive (no longer should the iconic Disney princess be reliant on men to strive) and deeply rooted in its themes of friendship, and all the ups and downs that follow. It’s here that directors Phil Johnston and Rich Moore, armed with a screenplay cowritten by Johnston and Pamela Ribon, find a common ground between family-friendly entertainment and sharp social satire. The smartest kind of sequel, Ralph Breaks the Internet remembers what you liked about the first film. And then, not only gives you more of the same, but something different. While the fun had at the expense of the internet isn’t exactly the freshest material, Ralph Breaks the Internet works well not because of where it sends its two main characters physically but rather emotionally. Ralph Breaks the Internet provides a fun, family-friendly time at the movies. It may lack the nostalgia-fueled power of the original, but it has a potent power source of its own in the messages it conveys. Amazingly enough, the result is a witty, visually inventive, and fittingly sober story about the perils of the internet, told through the eyes of a video-game avatar with unusually large forearms. Ralph Breaks the Internet dares to encourage kids to not only be themselves but allow their friends to be true to their wants and needs as well. Your friend doesn’t have to be exactly like you to be your friend. It’s a message that’s very well-threaded through an entertaining, clever ride. Ralph and Vanellope’s growth in the first film was what brought them together. Here, it’s what might force them apart. In Ralph Breaks the Internet, they’re attempting to hold on to one another while also trying to let go, and the film treats that struggle with sensitivity and care (along with some flatulence jokes). It’s breezy and fun and, like its predecessor, relies more for its appeal on nostalgia and familiarity than a strong narrative thrust. A weirder and more interesting movie than “Wreck-It Ralph,” Ralph Breaks the Internet tells a lie right in its title because isn’t that thing broken already? 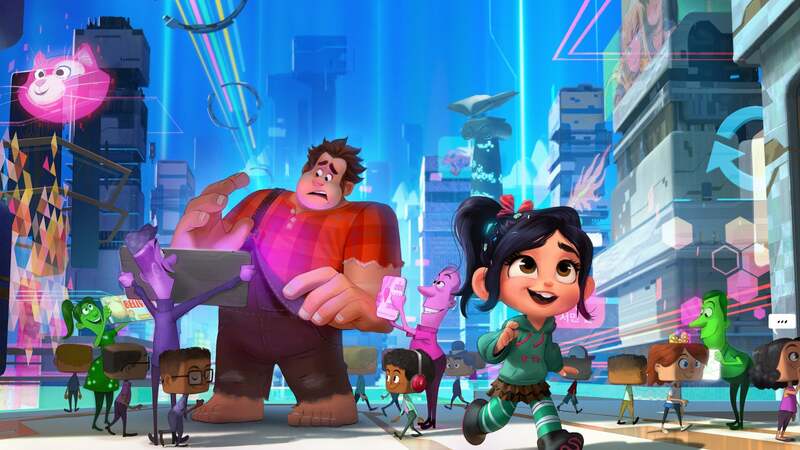 For such a sweet-natured, candy-colored, family-friendly animated adventure, Ralph Breaks the Internet serves up quite the mega-helping of meta material. As much as anything we’ve seen in recent years, the film is confirmation that artists, not paranoid executives, continue to make the big calls at Disney. And as long as that continues, a few glitches in the plot won’t ruin anyone’s good time. Like a lot of memes, Ralph Breaks The Internet appears proud both of its clear place within a system and its ability to stand outside and poke fun at that system. When Ralph Breaks the Internet ignores the glittering marvels of the internet and focuses on the rapport between its two leads, it's deeply moving. It’s a bit of a letdown, though still entertaining. The script unfortunately replicates one of the worst errors in "Toy Story 3": Sidelining just about every major supporting character from the early installments. There’s a thoughtful, kid-friendly parable about the hazards of internet fame somewhere in Ralph Breaks the Internet, but its aim is so scattershot that it only emerges in fits and starts. When it’s good, Ralph Breaks the Internet is very, very good. When it’s not, it’s annoying, cloying and LOUD! It’s a film whose best jokes are sight gags, but sight gags visualizing what eBay, Snapchat and Youtube look like from inside the web, mocking Internet Economics and the sorts of web content that lands “likes” and “shares.” These are plainly aimed at adults. While there’s something dispiriting and cynical about this conflation of product placement and pop commentary, it does give the film a kitchen sink quality: there is literally something for everyone. A so-so sequel enlivened by a few inspired moments. Ralph and Vanellope are still good company, but this concept might have worked better as a series of shorts. If Wreck-It Ralph was a film about jobs and self-image, the addition of commerce into that equation in its sequel makes everything exponentially more manic and unstable. And after nearly two hours of our eyeballs being flooded with savvy, incessant product placement of eBay, Amazon, Pinterest, and of course the entire Walt Disney Company portfolio, we’re all wrecked. Entertaining, and occasionally inspired, but Ralph Breaks The Internet is too often content to achieve a quick laugh, rather than exploring the themes its set-up suggests. 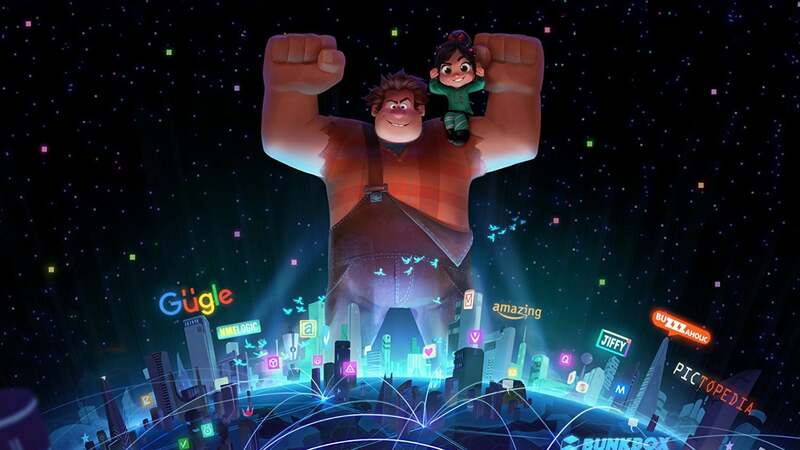 The sequel to 2012’s Wreck-It Ralph boasts a big heart and some clever comedic set pieces, and yet this follow-up fails to match the original’s balance of savvy pop-culture nostalgia and genuine emotional stakes. Ralph and Vanellope are still fun company, but their latest adventure is full of glitches. Ralph Breaks the Internet is a witty, fastidiously imagined adventure and a touching, sometimes troubling ode to the power of friendship. But it also demonstrates some of the problems that can befall a movie when its vast ambition and confidence outstrip its finesse. There are, to be sure, some worthwhile upgrades this time around — including one sequence that’s an instant classic — but it’s hard not to feel like you’ve already played this game once before. The incessant and eerily unsatirical product placement is enough to give you a migraine: especially the complacent Disney cross-promotion. It’s a stew so thick with brand loyalty that you just might choke on all the intellectual property and consequential commerce.